On this blog, I’ve really moved away from reviewing subscription boxes. As much as I might enjoy them, and as much as I might have to say about them, one single subscription box can take on a life of its own and really consume an entire blog. But for every rule, there’s an exception. 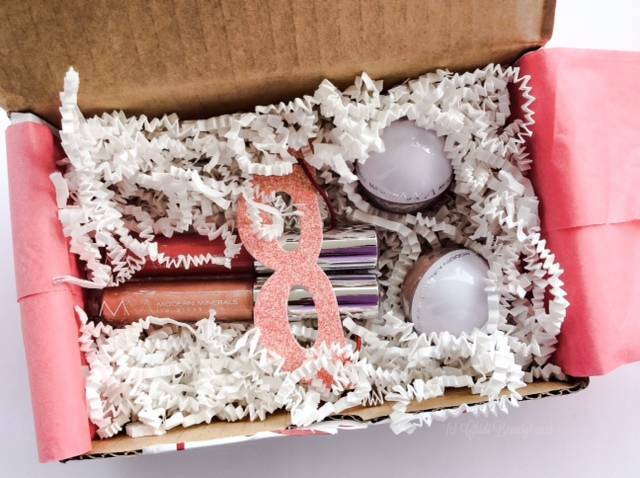 And today I am making an exception for this month’s Beauty Heroes Subscription Box. 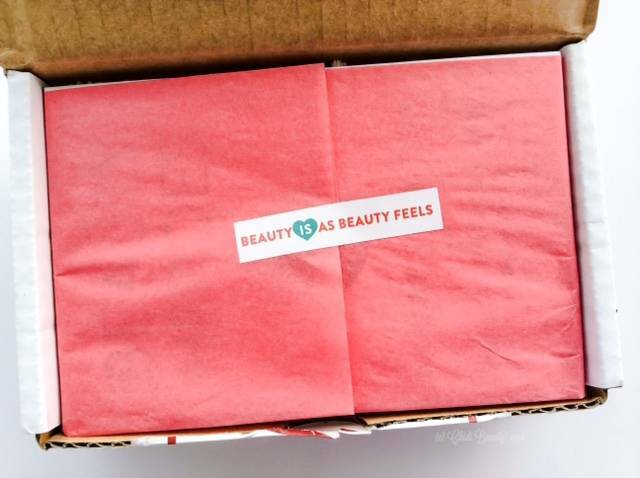 Beauty Heroes is by far one of the best green beauty subscription boxes around. The brand’s founder, Jeannie Jarnot, prides herself on choosing products that do not contain toxic (or “villain,” in Beauty Heroes lingo) ingredients. And the subscription box is always an awesome value. So far, after 5 months of being a subscriber, I have not been disappointed. This month Beauty Heroes teamed up with Modern Minerals Makeup to offer subscribers four makeup products that are said to “work on every skin tone.” Hmmm… I don’t know about you, but for many of us with dark brown skin, the words “work on every skin tone” and similar phrases usually translate to “work on other skin tones.” But, part of the beauty of subscription boxes is trying new products and, sometimes, hopefully, being pleasantly surprised. 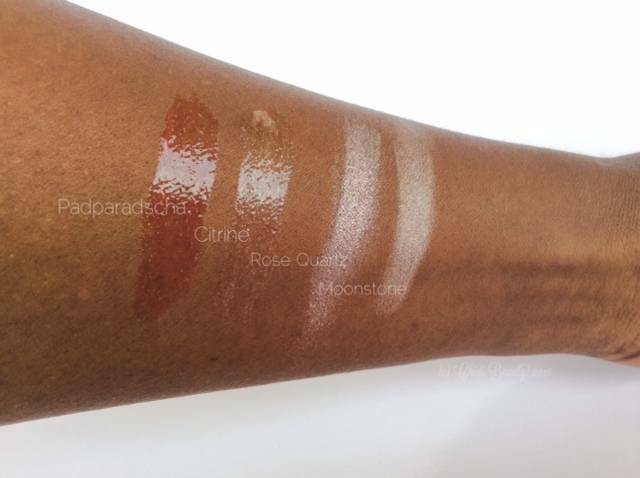 And, in this instance, I don’t mind being a guinea pig to see if the products Beauty Heroes selected from Modern Minerals Makeup really do work on darker skin tones. 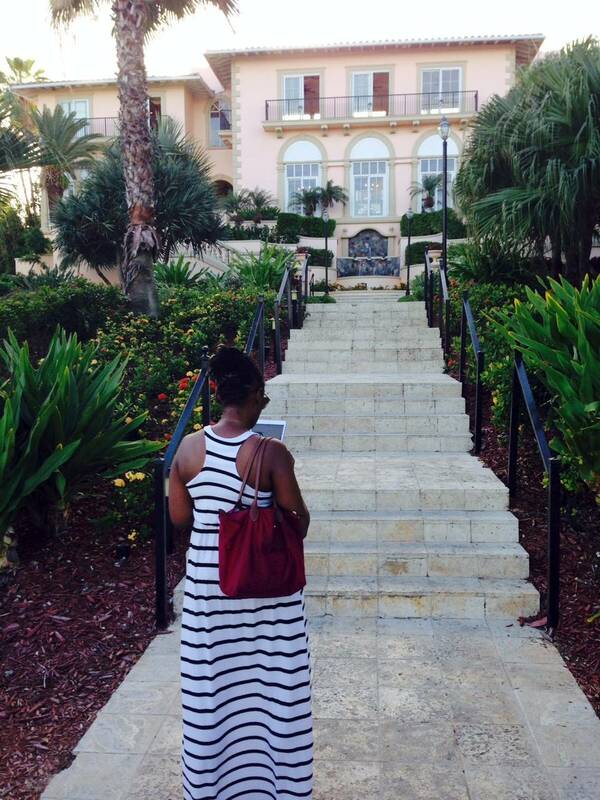 Subscribing to Beauty Heroes costs less than $39.00 per month. The total value of this month’s box is $96.00, and if you’re not already a subscriber you can get it by signing up here before June 20th. 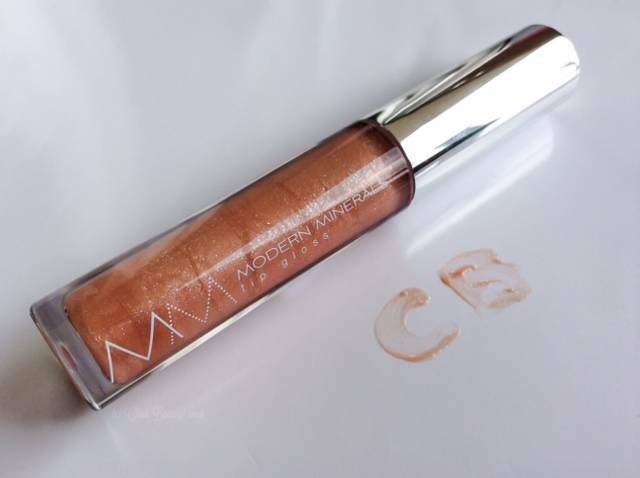 Or you can click here to shop the Modern Minerals Makeup line in the Beauty Heroes store. Emotive Lotus Wei Infused Lip Gloss in Padparadscha is the product I was most excited about. The coral colour is so pretty, perfect for my upcoming summer vacation, and one I really hoped would be flattering on me. Having tried it, Padparadscha gets two thumbs up. It provides the slightest wash of colour, and is ideal for layering over a lipstick or lip pencil, or wearing alone to add a just-bitten flush to your lips. This gloss is scented, and I can’t quite palace it, but it is a very floral and perfume-y scent. For someone who is sensitive to different smells it can be bothersome, but the scent does fade after a few minutes, leaving only a pretty, subtle colour behind. 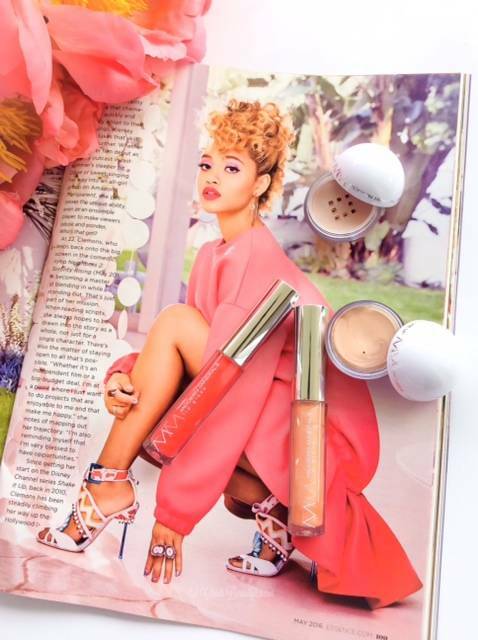 Invigorating Lip Gloss in Citrine is a neutral shimmery lip gloss. This gold-flecked gloss is more clumpy than its Lotus Wei counterpart, but equally pretty. Citrine is translucent with a subtle gold sparkle, and it imparts some serious shine on your pout. I love the scent, which is minty and reminiscent of a mojito. But a little bit of this gloss got into my mouth and, well, let’s just say the taste does not match the smell. The Invigorating Lip Gloss tingles once it is applied, but I did not notice (or want) any plumping action. All in all this is a pretty gloss that can be worn year-round. 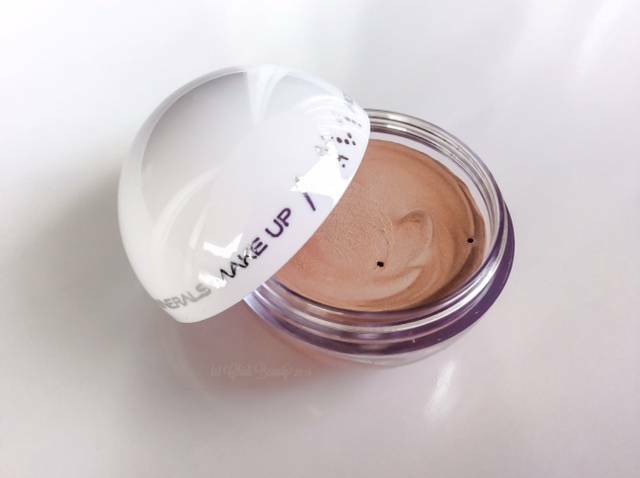 Modern Moonstone Cream Highlighter is the product I was least excited about. I really didn’t think it would be flattering for my skin tone, and isn’t something I would have purchased for myself. As you can see in the picture above, this highlighter has white/silver undertones. What may not be apparent is that it also contains sparkles so if that isn’t your thing, buyer beware. However, using the tiniest amount of this highlighter actually does work on dark brown skin. Dab a finger in the highlighter, dot it across the area you want to highlight, and blend until the colour disappears. * You will be left with a subtle shimmer. It really didn’t do much for me, but I was, surprisingly, able to make it work for my skin tone. Flower Infused Eyeshadow in Rose Quartz is a pretty blush with metallic peach/pink undertones and lots of sparkle. 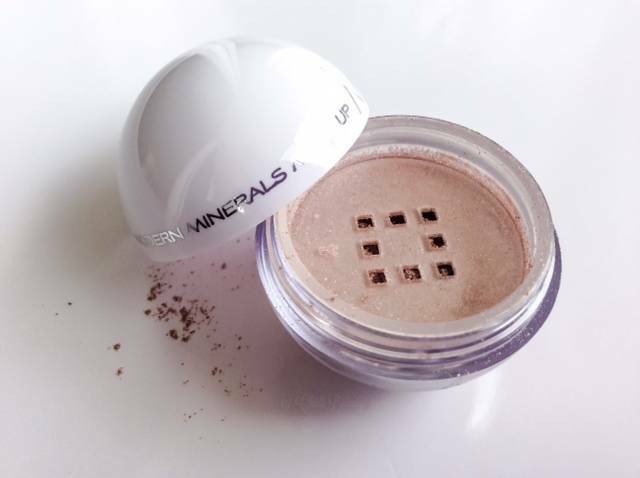 Applied intensely, this eyeshadow has a futuristic look on dark brown skin. Needless to say, absent an invitation to a repeat of the 2016 Met Gala, this is not a buildable eyeshadow for my complexion. However, when I was getting ready to go out this past weekend I dipped my ring finger in the Rose Quartz loose powder and blended it on each eyelid until the colour disappeared. * What was left was the prettiest shimmer for a barely there summer makeup look. 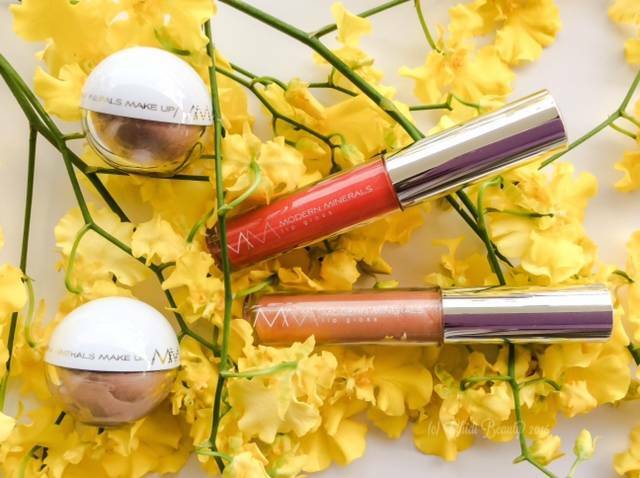 It was perfect for a pared-down summer makeup routine, and a great complement to the Invigorating Lip Gloss in Citrine. All in all, I am pleased with the Beauty Heroes June 2016 Subscription Box. As usual, the products are packed with great ingredients, from Aloe Vera to Vitamin E and flower essences. 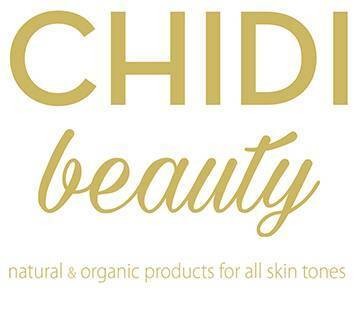 Beauty Heroes introduced me to a new green beauty brand that is also cruelty-free and vegan-friendly. I have two new lip glosses that I love – and lip gloss is my absolute favourite type of makeup. I have a new eyeshadow that I can wear all summer long, especially on those days (most days) when I don’t feel like wearing much makeup. And I have a new highlighter to play with, or give away and make another makeup-lover happy. What’s not to love? It’s always a pleasure to hear from you. 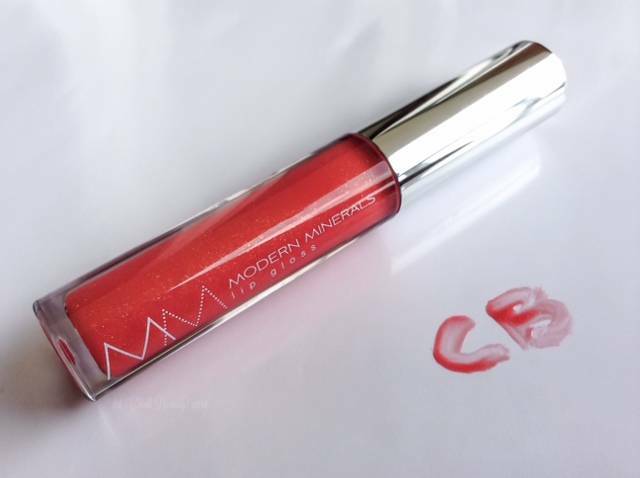 If you have tried Modern Minerals Makeup, share your thoughts, swatches and links to your reviews in the comments section below! Or you can read some other great reviews here and here. * Yes, I realize the irony of having to blend makeup until the colour disappears to make it “work” for my skin tone. However, highlighters, at least, should not noticeably sit on your face. And more importantly, that is an entirely different topic for another day.